About two months back I borrowed the book Family vegetarian Cooking by Good Housekeeping, from the library. The book is filled with amazing vegetarian recipes. I would say that the soups, stews and chillis section alone is worth the price of the entire book. I’m trying one recipe after the other from that book and so keep renewing it every 3 weeks. Thank goodness we have the online renewal facility! Actually, I have exhausted the maximum number of renewals and have to return the book pretty soon. I think I have to borrow it once again to try the rest of the recipes. So do borrow the book when you get a chance. So far I have loved all the soup recipes I have tried from that book. 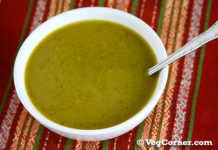 I have already blogged about the Red Lentils and Vegetable soup recipe here when it was featured in the magazine. The only dish I didn’t like was the Portabello Mushroom Pizza. I’m pretty sure that it’s nothing to do with the recipe but for my aversion of mushrooms. After so many years in North America, I have finally got over my phobia/dislike for white mushrooms only quite recently. I think it will take another decade to get over my “it’s-disgusting” phase for the portabellos. Is it me or does anybody else feel that the smell of it is not that appetizing? The odor is too pungent for me to look beyond that and enjoy it for its nutritive value. Okay enough about the mushrooms, I have to save something for my Cream of Mushroom Soup post. 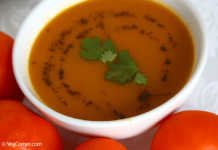 Let’s take a look at this different type of carrot soup recipe which also uses a considerable amount of apples. Yes, apples! You heard me right. This is my first experience with using apples in a soup recipe and I should say that it’s definitely good. Carrots, apple and ginger brought together in this soup recipe making it unique, interesting and tasty too. In a pressure cooker warm the olive oil. Add onion, salt and sugar; cook until tender and let it caramelize, stirring occasionally. To the onions add the carrots, apples and ginger; Sauteed it for about 2 minutes adding some more salt. Add the vegetable broth or water just enough to cover the vegetables; stir it all together and close the pressure cooker with its lid and cook for 1 whistle or for about 20 minutes for those who are not using a pressure cooker. Once the pressure is released, puree the mixture using a hand-held blender until very smooth. 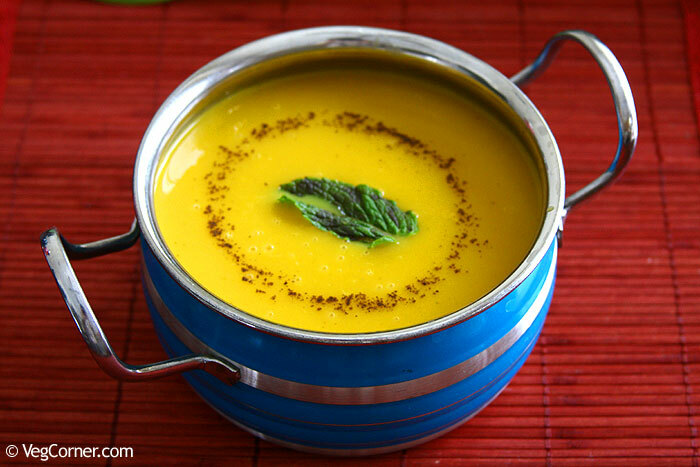 This can be done directly in the pressure cooker (or any other pot you are cooking). That’s the beauty of using an immersion blender. You will have to wait for the soup to cool completely if you have to use the regular blender. Simmer the pureed soup for another 5 minutes adding the remaining 2 cups (more or less depending on the consistency you prefer) of water. Season it with some more salt and pepper as needed. After tasting the soup at this stage I felt that something was missing and that’s when I decided to add some lemon juice and I used the juice of half a lemon and it gave a nice flavor to the soup. I was very skeptical of this carrot soup because I haven’t tried apples in a soup before. From the spinach smoothie post you must know that I’m not very daring when it comes to mixing ingredients which we do not usually combine together. So, as usual, I was not excited about tasting this new combo. And as usual, I was surprised that it was not awful but awesome. You must be thinking that this sort of thing, how I try something new without much expectation for it and how it turns into an amazing dish is becoming an cliche here but I cannot help it guys. I’m constantly being amazed about how two ingredients which have nothing in common come together to make a delicious dish! So this soup is no exception to that. The only thing I felt the recipe needed was some lemon juice. Once I added that the soup was perfect. I think the taste of this soup depends upon the taste of the apples. The apples I used was quite sweet and that showed up pretty well in the soup. I think the next time around I will be increasing the quantity of ginger while using very sweet apples because the flavor of ginger was masked by the sweetness of the apples. Using a pressure cooker is not compulsory but I definitely recommend using one because it’s a time saver in the kitchen. If you don’t have one, use any other pot and follow the same procedure but just give some more time for the entire process. The same holds good if you are not using an immersion blender too. Since you have to wait for the cooked vegetables to cool down for blending it, it may take another 20-30 minutes extra to prepare the soup. The apples I used were too sweet and that’s why I had to add some lemon juice to round it off but if the apples are sour, then do not add the lemon juice, instead increase the quantity of the carrots to balance it. I’m also thinking of incorporating some mint in this recipe the next time. Using some curry powder (or Garam Masala powder) instead of the pepper while giving a different flavor to the soup. 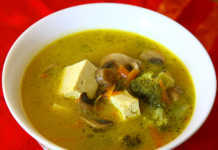 Omg, wat a wonderful bowl of super tempting soup, incredible combo,thanks for sending Madhu. I have made with orange/carrot combo, but apple would be great also. I feel like grabbing ur pot! Very nice colour soup. Hope tastes very delicious. I will also try.